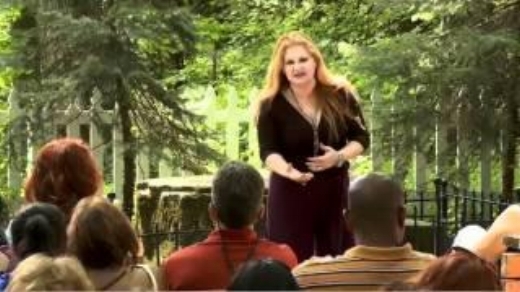 Famous Psychic Medium Michelle Whitedove speaks at Lily Dale, the oldest an most revered Spiritualist community in the United States. She is the author of six books about life, death and the adventures of the soul. Have you been to Lily Dale? It's such a special place. Originally a Free Thinkers Society established in the 1800's and it's still a mecca. According to the Smithsonian, "Susan B. Anthony, the grande dame of the women's suffrage movement, made her first of several public appearances in Lily Dale's auditorium in 1891." People would travel a hundred miles to listen to speakers. .
Today Lily Dale is known to be the oldest and most revered Spiritualist community in the United States. People come seeking proof that their loved ones have survived the transition that we call "Death". Those with inquiring minds want to learn about Spiritualism and other individuals are interested in developing their intuition and learning "How To" connect with the Heavens. I was first invited to Lily Dale in 2010 as a Season Highlight Speaker. As I entered the gate of “THE CITY OF LIGHT” I was enthralled by the energy of Lily Dale. Surrounded by lakes, this is a quiet lakeside community with Victorian homes, cottages, a museum, gift shops, a few eating establishments and a huge old hotel (circa 1880) with a wraparound porch and rocking chairs , it’s called the Maplewood. .My Postcard dated 1910 Lily Dale, NY . Every summer, throngs of visitors pour in from all around the world for Summer Season. Why? Lily Dale is the largest Spiritualist Community in the World. During the summer they have an entire program of classes and lectures given by metaphysical teachers, bestselling authors, teachers and Celebrity Psychic Mediums like me, Michelle Whitedove. Tickets are $50 person when purchased in advance from Lily Dale online. $50 at the door. And there is so much more to do and see! Every day during the summer, there are several gathering places where you can go to get messages from your departed loved ones. You see, Spiritualism is a religion that believes in the communication between the Earthly plane and the Heavens by means of mediumship. Read the Tenants of Spiritualism . They endeavor to prove the continuance of life. You’ll see people were bustling about, headed to a Message Service, going to a lecture or to an appointment with one of the 50+ registered mediums. As a medium, I can feel the sacredness of this land and I can see the Native American souls that protect it. I see the Spirits in service at the healing temple. I see the Angels that gather when they resonate with the teachings and they help to spread unconditional love and open hearts to hear the truth. There are nature spirits here in abundance too; so be sure to go into the forests and along the fairy trails. And of course there are departed loved ones who drop in because they know that you’re visiting! As years progressed, I sensed a new found devotion to Lily Dale and wanted to be a bigger part of this close knit Spiritual Community. I joined the Church of the Living Spirit and then became a member of Lily Dale. Wanting to be of service, I was approached to do Fundraising for the Children’s scholarship fund along with the yearly Season Highlight. Thus far I’ve raised $8500 for the children. - I’m glad to be of service! Lily Dale is special to me; I’ve given my time, money, and these past two years, even my blood, sweat and tears transforming and completely renovating a home. My goal is to be of service while adding my credentials and influence to help increase Lily Dale’s legacy in modern times. Spirit says, “Lily Dale needs the next generations of authentic, well known mediums to be a force in continuing the spiritual legacy. “ For the record, I Michelle Whitedove, am the most tested Medium in America. BIO: Spiritual Medium Michelle Whitedove, an expert in her field, she has been featured on: ABC, CBS, FOX, PBS TV, and NPR Radio to discuss the reality of authentic spirit communication. Tested on TV more than any American Medium, Lifetime TV named Michelle Whitedove "America’s #1 Psychic" after testing her supernatural abilities on TV. She went on to do even more extreme tests on European TV in Sixth Sense International a prestigious TV show that aired in nineteen countries with world’s top Mediums. Whitedove was featured in the HBO documentary NO ONE DIES IN LILY DALE and interviewed by Matt Lauer on the TODAY Show. She was on BRAVO TV’s Millionaire Matchmaker as an Expert Medium helping the host discover information about a deceased relative and recently she was on Japan TV working a murder case as a psychic detective. Michelle is also a Keynote speaker, an Author of 6 books about the journey of the soul and 2 more are forthcoming. Michelle continues to do readings and give to charity. 2017 was my 8th year serving Lily Dale, on July 15th I gave 32 messages at the round robin reading fundraiser, raising $1600 for the children’s scholarship fund. Then I gave a two hour lecture and 38 audience messages at my seasons highlight event. Seventy messages in one day is a lot. Name any Medium that does that? It’s important for me to touch as many souls as possible, I realize that people travel long distances in the hopes to get a message. I always do my best to serve Spirit and Lily Dale with integrity and generosity. I hope to see to see you there! SIGN UP to be notified by email then all the details of my appearances and my blog will be delivered to your IN Box! Go to www.LilyDaleAssembly.com to see the list of special events! I love Lily Dale and you will too!